Bashirieh, S, Mesbah, S, Redi, J.A, Bozzon, A, Szlàvik, Z, & Sips, Robert-Jan. (2017). 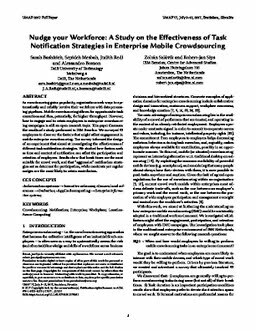 Nudge your Workforce: A Study on the Effectiveness of Task Notification Strategies in Enterprise Mobile Crowdsourcing. In Proceedings of the 25th Conference on User Modeling, Adaptation and Personalization (pp. 4–12).